If you have ever gone to Connecticut, you surely have heard or even visit a famous casino and hotel called the Mohegan Sun. This 34-story establishment was built by a Native American tribe in 1996 and has since been known for having facilities that can accommodate people of various ages. 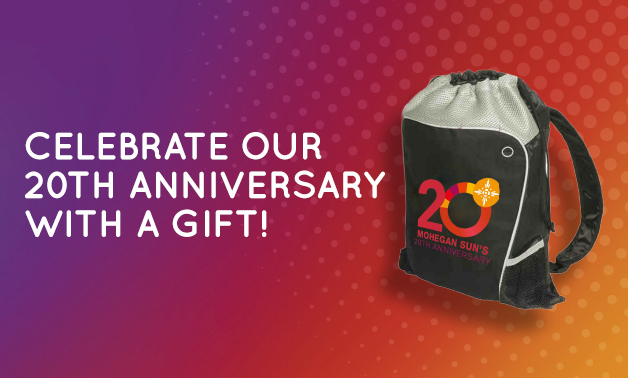 For their 20th anniversary, its administrators have invited a lot of artists for live performances and prepared special freebies such as this branded backpack. Better Brand Reachability. Since this is a hotel, chances are, the sales will come mostly from the tourists and not from the folks who live nearby. The guests who are going to receive the promotional gift will go back to their own state or country after a few days and ideally use it in their future outings. Thus, the word about the Mohegan Sun will reach thousands of miles. More People Will Love To Visit. The good consequence of what’s been mentioned above is that more people will be interested to pay the hotel a visit. This is how they can garner extra sales, and the cost of making the each backpack will almost become negligible in the end. Try to discover more advertising strategies from our blog today.